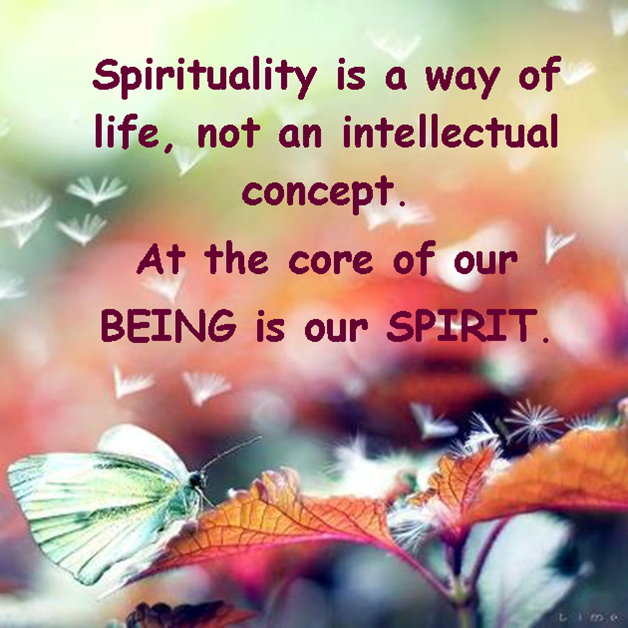 Although there are many definitions of Spirituality, I prefer to think of it as one’s own experience with the divine. Spirituality fosters an inner awareness and trust in something which although unseen, is available to us daily. It’s in understanding we have an inner wisdom and power guiding us daily, we just need to tune in with it. At first it’s difficult to discern between what the guidance is and what the mind tells you. Gradually however, as you practice tuning in, the guidance becomes something you can trust. It takes time but eventually you begin to have experiences which you come to rely on. Building trust takes time, however. For instance, when I have car trouble I trust my mechanic to fix it. Though I didn’t trust him in the beginning, over time trust’s developed through having positive experiences with his work. In a similar manner, you learn to trust your inner guidance. I believe we are sustained by something bigger than ourselves. This understanding has developed through my practice of universal principles which exist in our natural world. As you practice, life begins to change in wonderful ways. You develop a deeper, richer connection with yourself and the world around you. Whatever name you give to the power within, if you tune in and follow, your life’s journey takes on an entirely new meaning and direction. In a broader sense Spirituality is an intuitive awareness of our connection to nature and the responsibility we have to take care of it. Take away the tar and cement and there’s only ourselves surrounded by nature. Each day nature provides clean air and water for our use. Without either our existence on the planet would cease to exist, would it not? Ultimately, no one can define another person’s understanding of Spirituality or the relationship they have with Spirit. It’s a personal journey for each of us and I believe that’s why we’re here. To awaken, to explore, and to experience ourselves as Spiritual beings having a material existence.